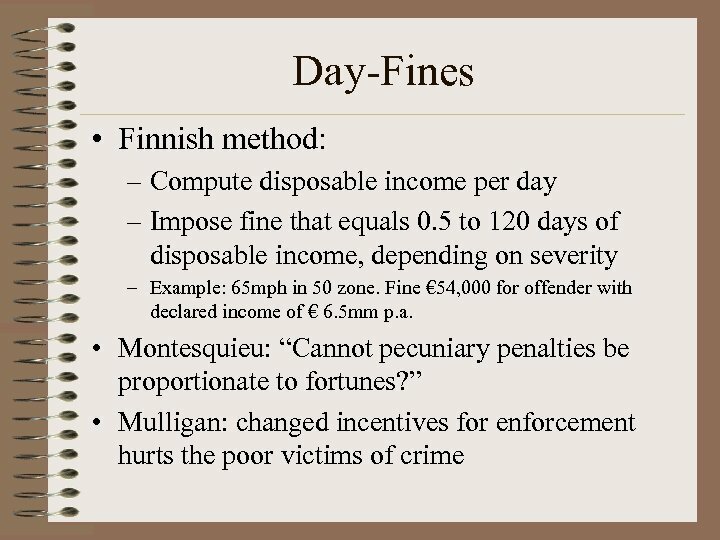 Question Should speeding fines be means-tested as they are in many European countries? 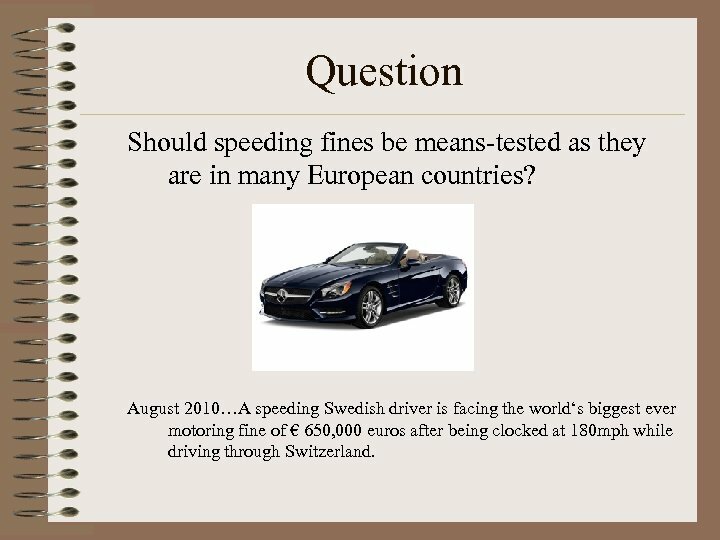 August 2010…A speeding Swedish driver is facing the world‘s biggest ever motoring fine of € 650, 000 euros after being clocked at 180 mph while driving through Switzerland. 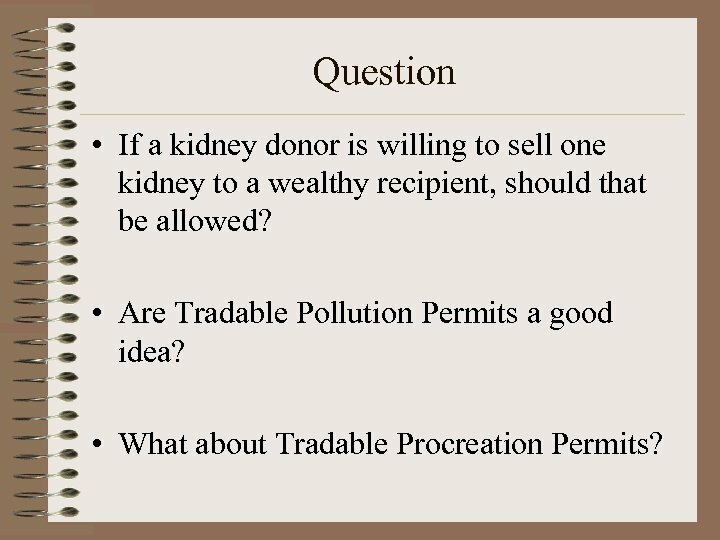 Question • If a kidney donor is willing to sell one kidney to a wealthy recipient, should that be allowed? 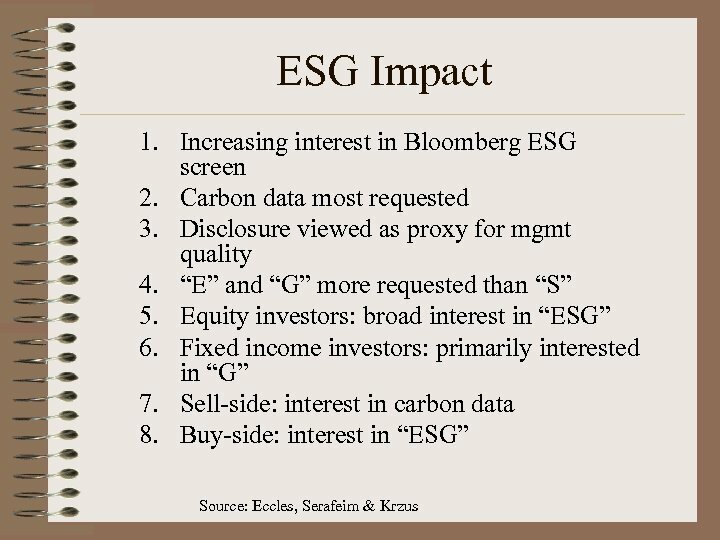 • Are Tradable Pollution Permits a good idea? 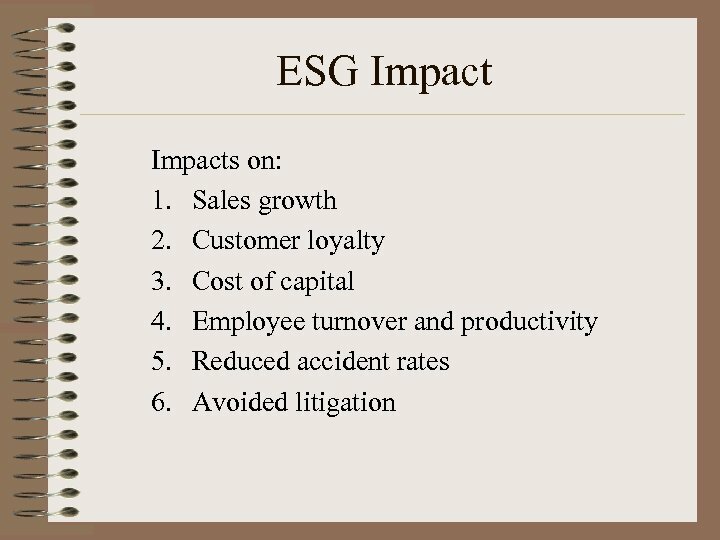 • What about Tradable Procreation Permits? 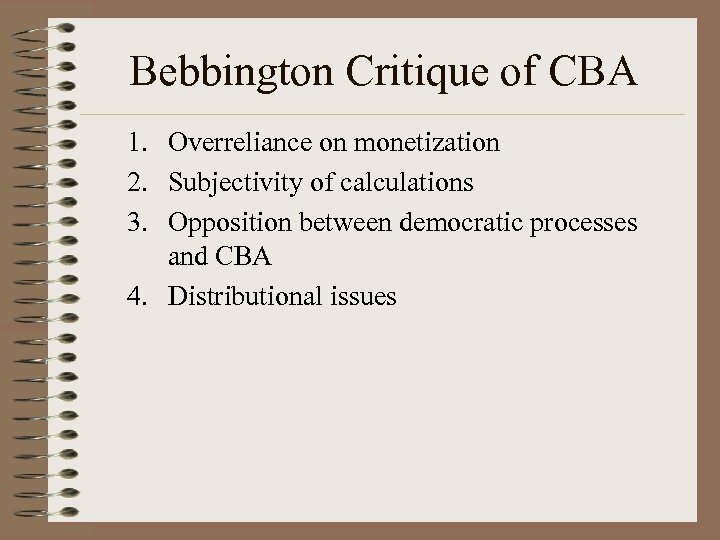 Kelman Critique of CBA 1. 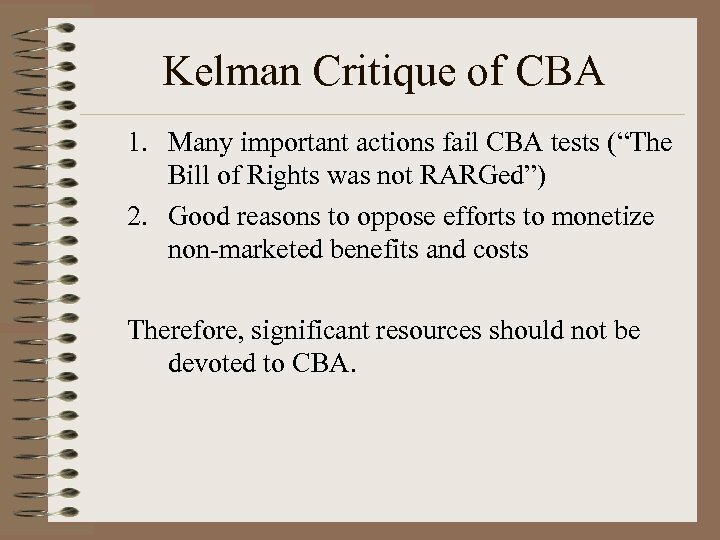 Many important actions fail CBA tests (“The Bill of Rights was not RARGed”) 2. 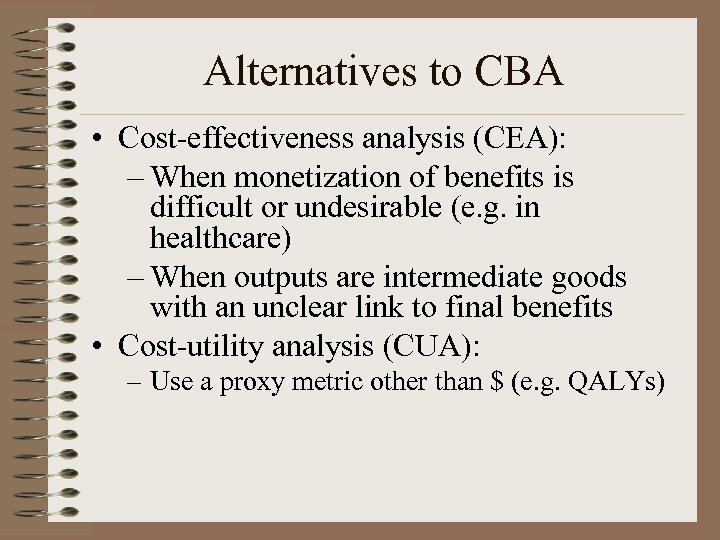 Good reasons to oppose efforts to monetize non-marketed benefits and costs Therefore, significant resources should not be devoted to CBA. 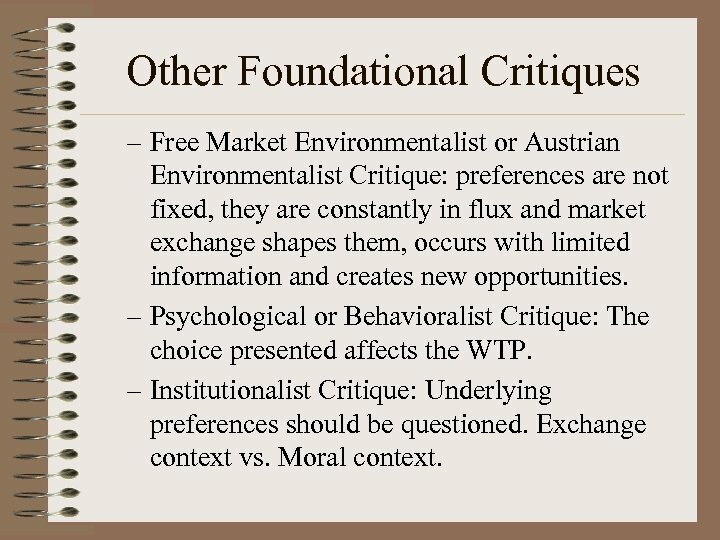 Other Foundational Critiques – Free Market Environmentalist or Austrian Environmentalist Critique: preferences are not fixed, they are constantly in flux and market exchange shapes them, occurs with limited information and creates new opportunities. 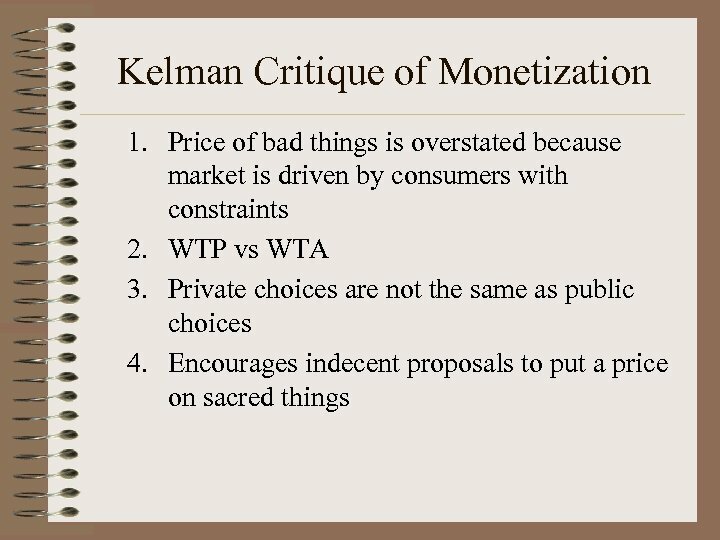 – Psychological or Behavioralist Critique: The choice presented affects the WTP. 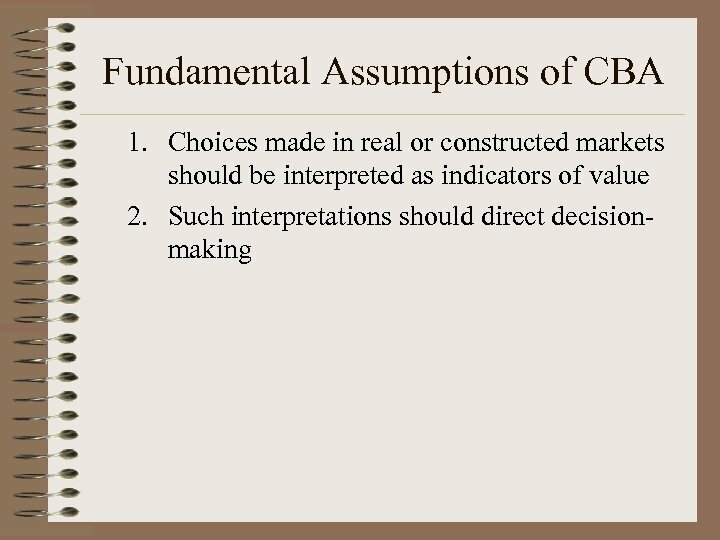 – Institutionalist Critique: Underlying preferences should be questioned. 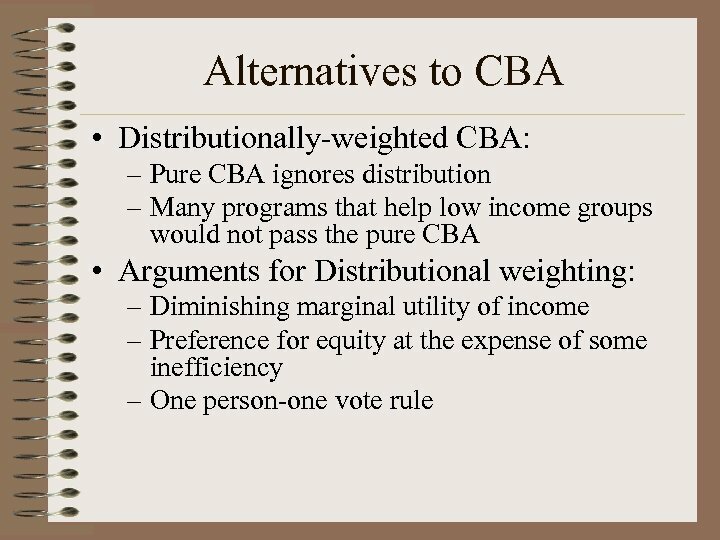 Exchange context vs. 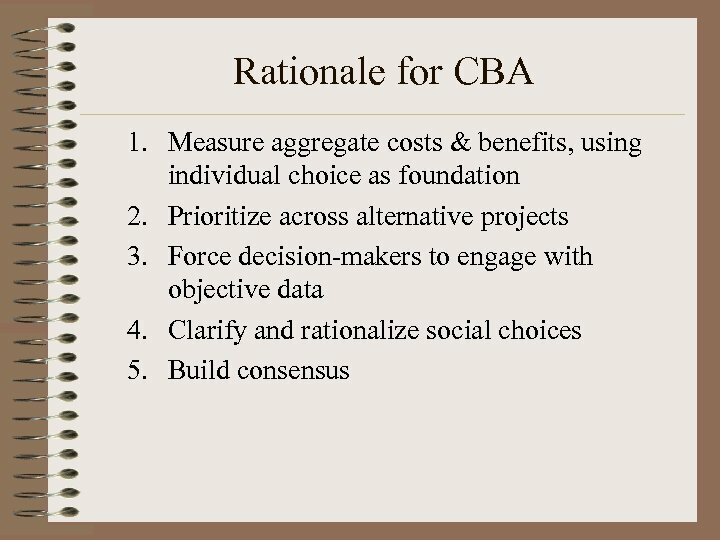 Moral context. 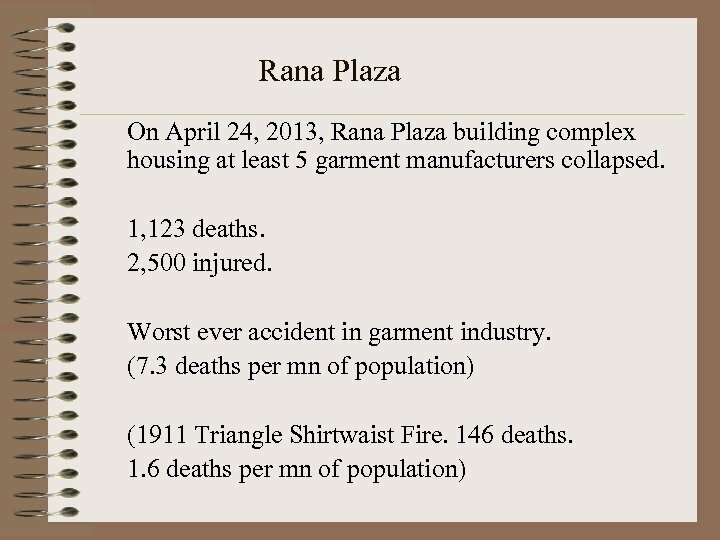 Rana Plaza Mean GDP per capita $800 per year. Workers primarily women. 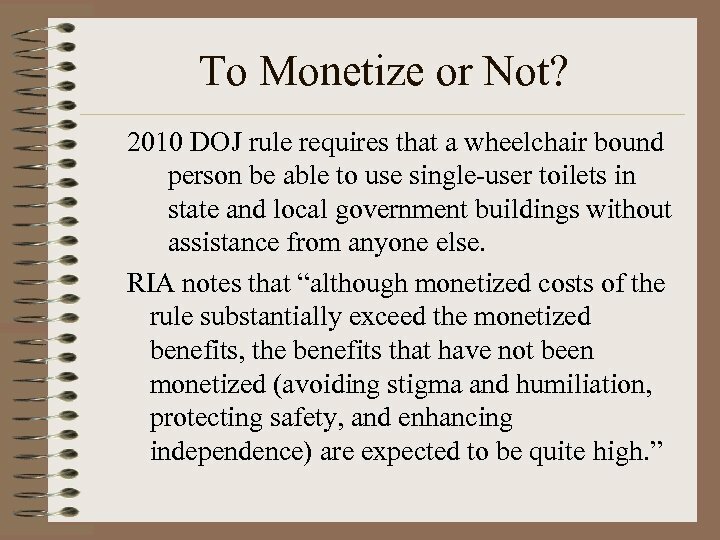 Alternative occupation: domestic service Wages $37 per month. 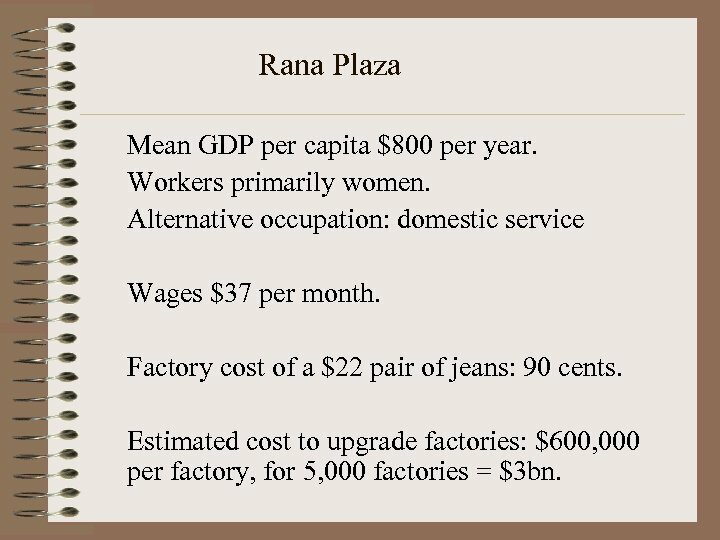 Factory cost of a $22 pair of jeans: 90 cents. 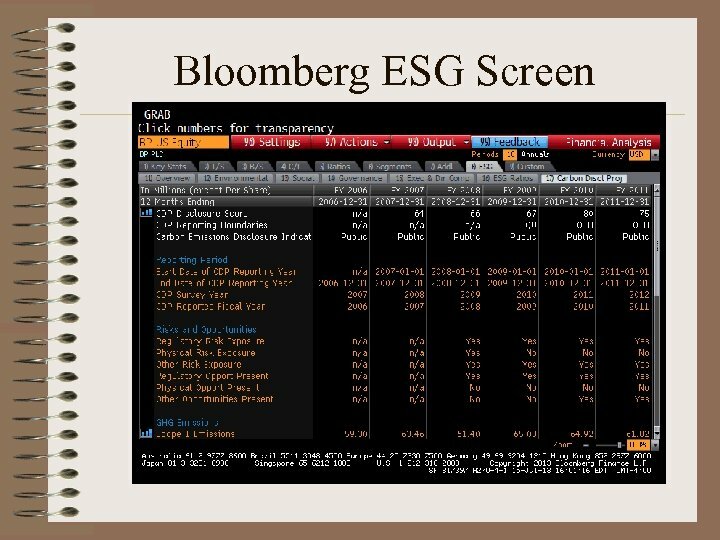 Estimated cost to upgrade factories: $600, 000 per factory, for 5, 000 factories = $3 bn. 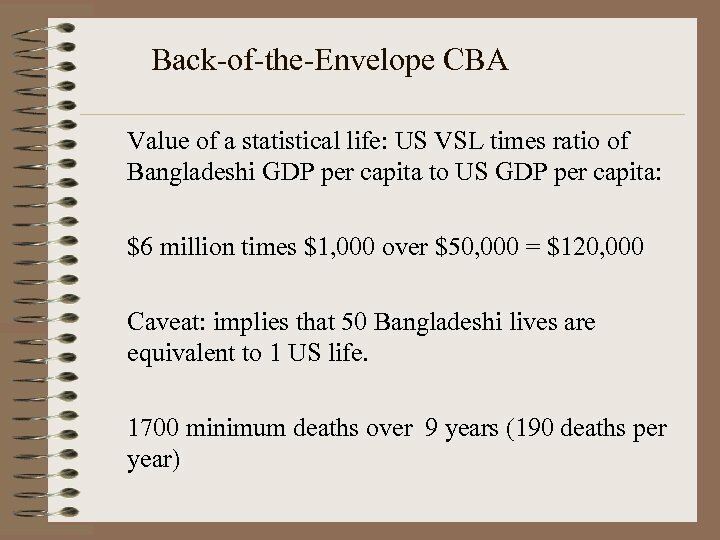 Back-of-the-Envelope CBA $3 bn capital cost amortized over a life of 5 yrs = $600 mn per year, to prevent 190 deaths. 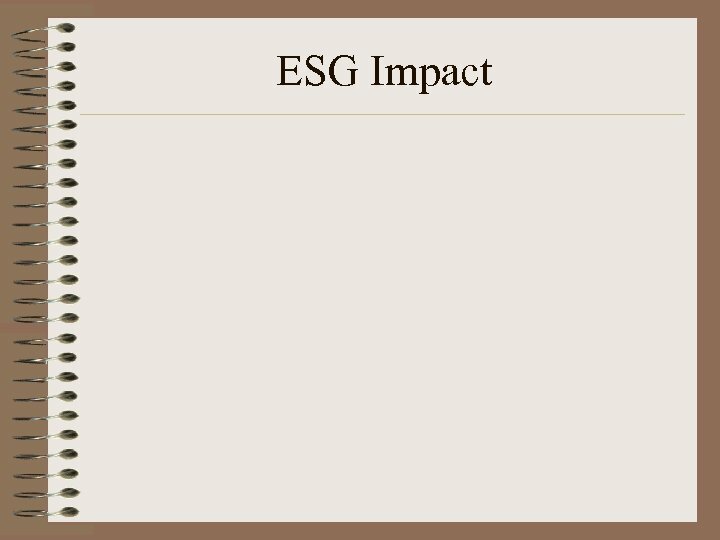 Spend $600 mn per year to save $23 mn per year. 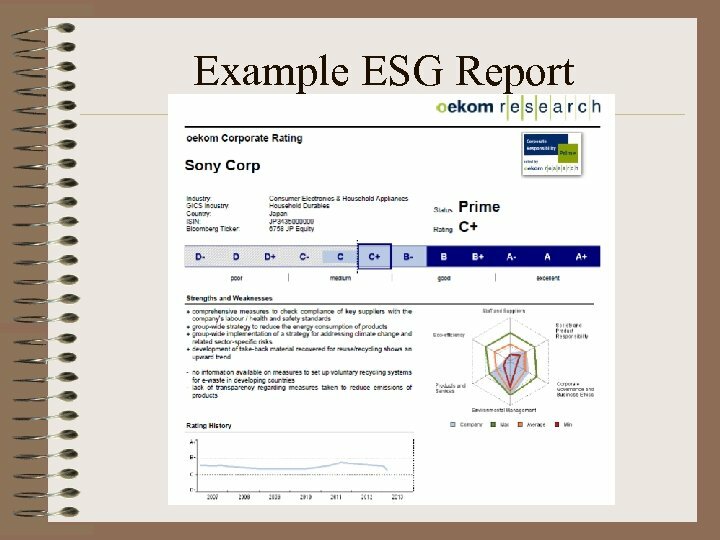 (little higher than ILO recommendation) DOES NOT WORK. 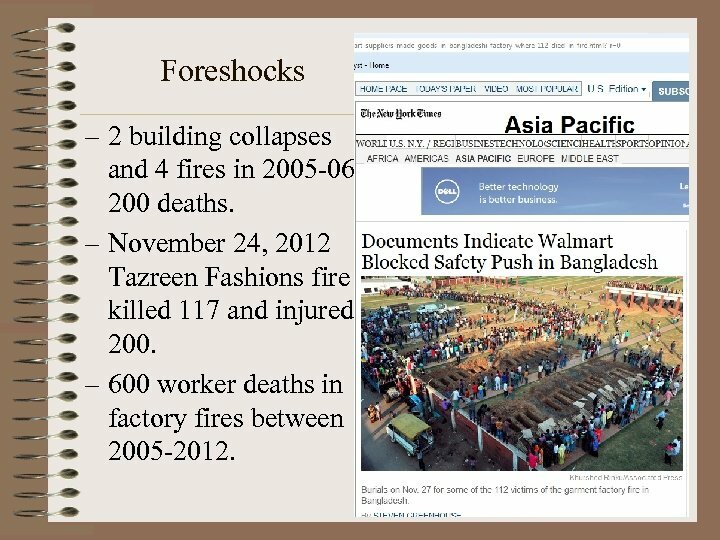 7 billion garments sold annually by Bangladesh to Western brands. 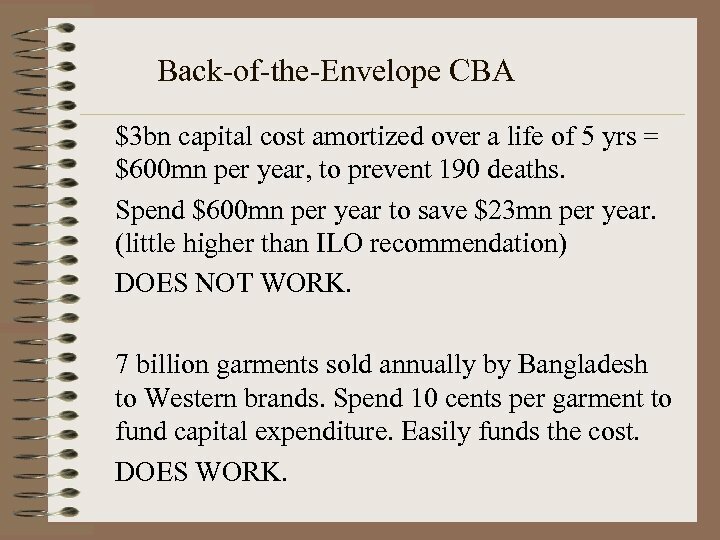 Spend 10 cents per garment to fund capital expenditure. 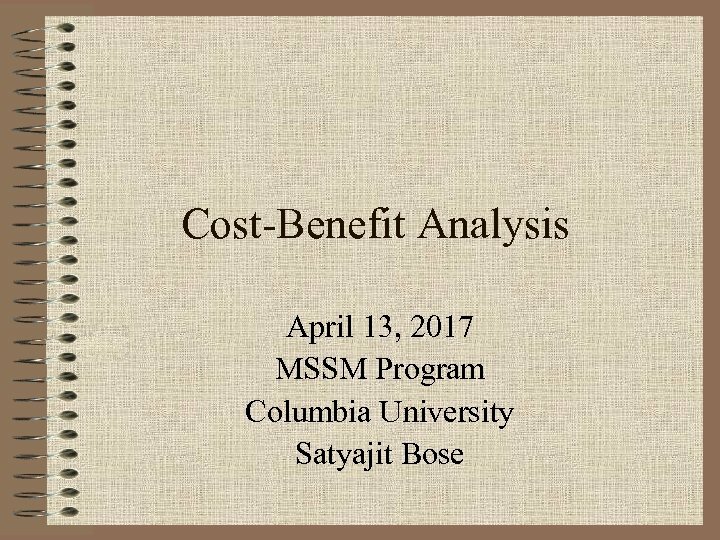 Easily funds the cost. DOES WORK. 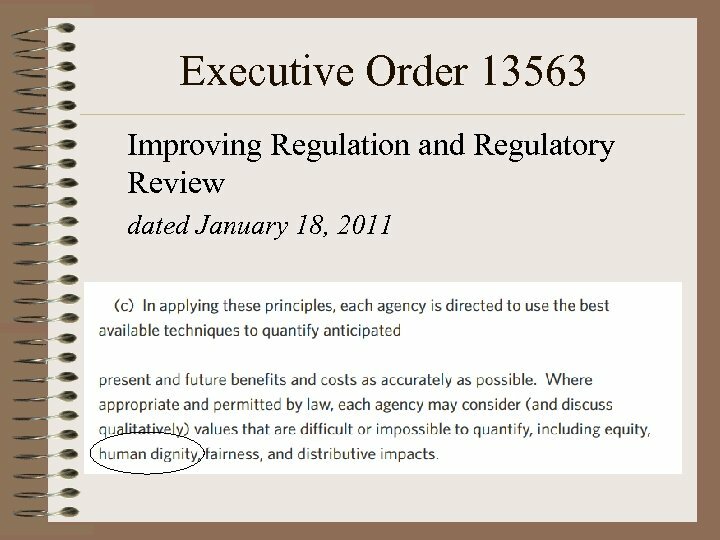 Systemic Issues Codes of conduct: Voluntary. 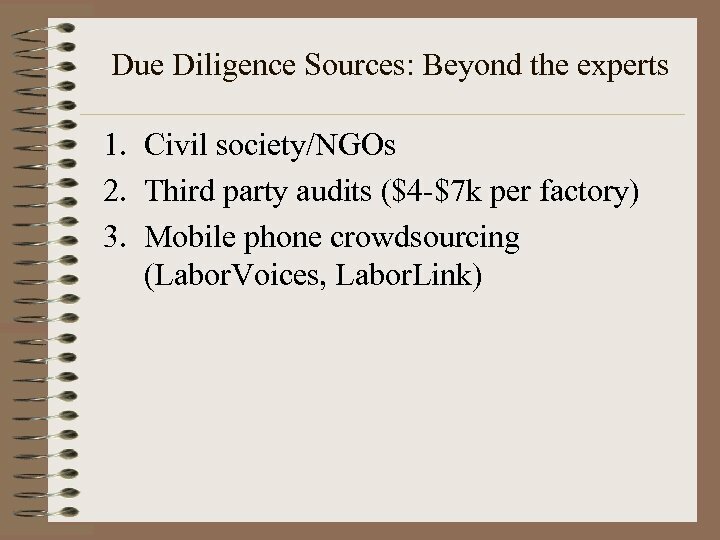 Audits: Two manufacturers in the complex had recently passed audits. 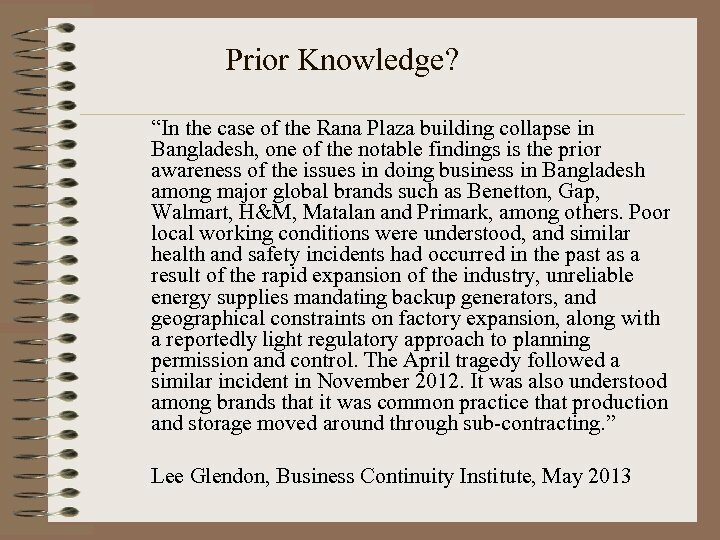 With one exception, all buildings collapsed or in fires since 2010 had passed multiple inspections. 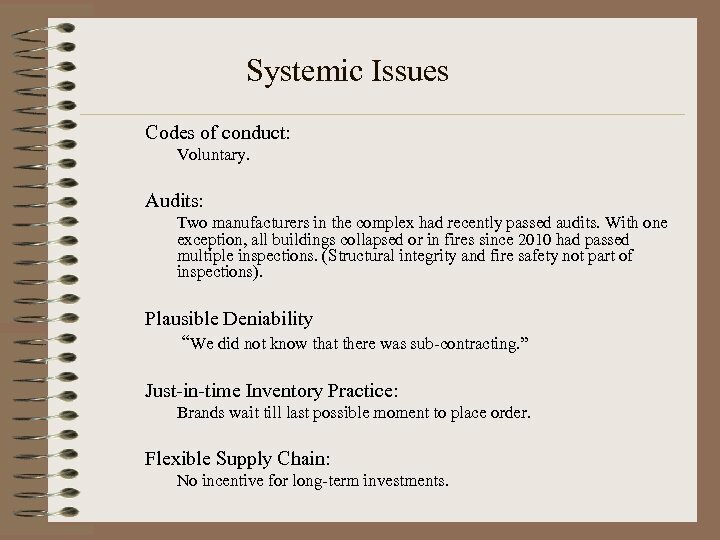 (Structural integrity and fire safety not part of inspections). 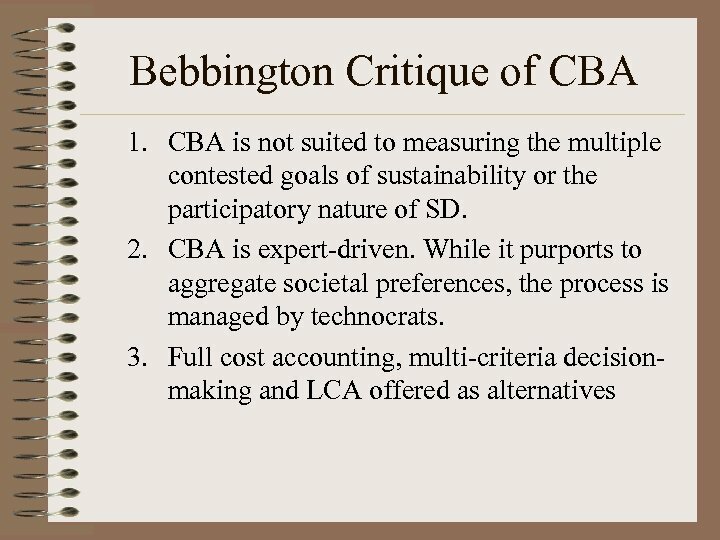 Plausible Deniability “We did not know that there was sub-contracting. 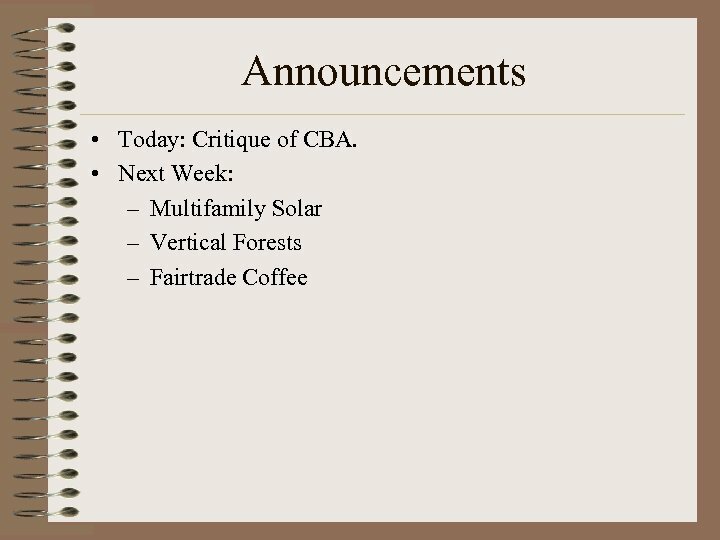 ” Just-in-time Inventory Practice: Brands wait till last possible moment to place order. 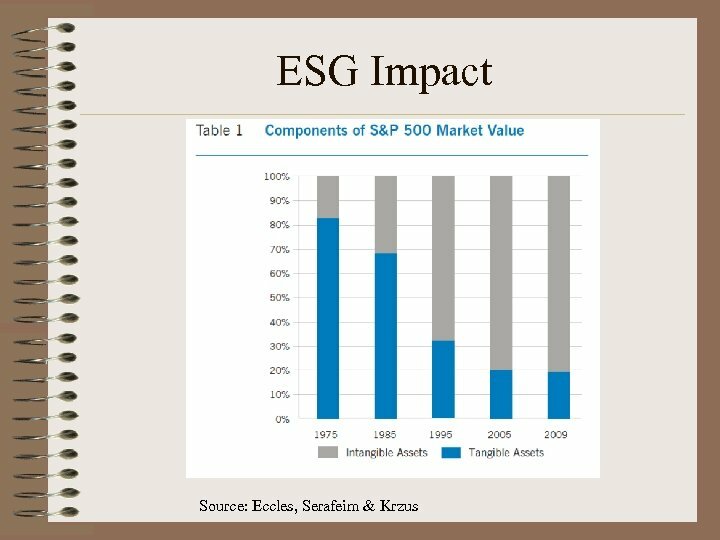 Flexible Supply Chain: No incentive for long-term investments. 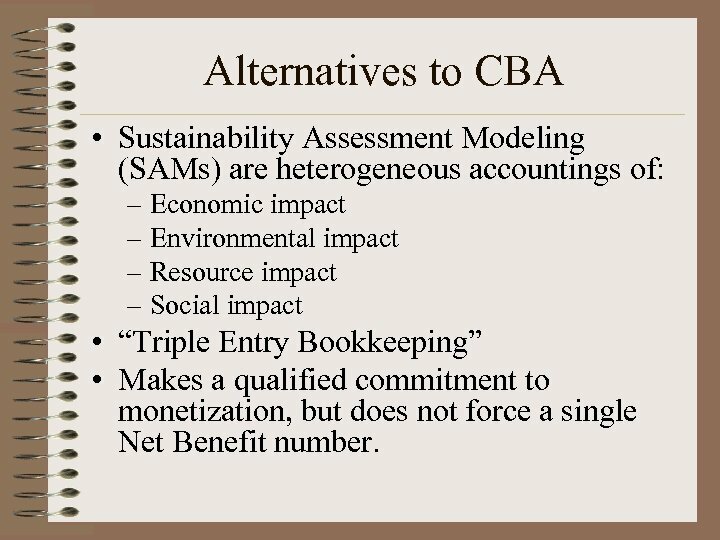 Alternatives to CBA • Sustainability Assessment Modeling (SAMs) are heterogeneous accountings of: – Economic impact – Environmental impact – Resource impact – Social impact • “Triple Entry Bookkeeping” • Makes a qualified commitment to monetization, but does not force a single Net Benefit number.